Frederick John Robinson was the younger son of the 2nd Baron Grantham, and was raised mainly by his mother, the daughter of the 2nd Earl of Hardwicke, after his father died when he was three years old. He was educated at Harrow and then St John’s College, Cambridge, before proceeding to Lincoln’s Inn in 1802. Robinson’s political career was initially sponsored by his uncle, the 3rd Earl of Hardwicke, who as Lord Lieutenant of Ireland made him his private secretary in Dublin in 1804 and then secured him a parliamentary seat at Carlow in 1806 (in 1807 he was elected MP for Ripon thanks to another relative). Robinson’s speeches attracted particularly favourable notice, one of 1812 being judged by one listener ‘the best young man’s speech I ever heard in parliament’. By then Robinson had developed an association with Lord Castlereagh whom he served as under-secretary in the War Office from May 1809, and initially refused office under Perceval before joining the Admiralty Board in June 1810. When Castlereagh joined Lord Liverpool’s administration in 1812, however, Robinson was promoted to Vice-President of the Board of Trade. It fell to him to introduce the controversial protectionist Corn Laws of 1815, provoking attacks on his home by protestors, in one of which two people died. For Robinson this measure was probably an unwelcome necessity, and such pragmatism also explains his subsequent and apparently contradictory emergence as a leading architect of ‘Liberal Tory’ economic policy, first as President of the Board of Trade from 1818 and then Chancellor of the Exchequer from 1823. His role in such measures as the abolition of the Navigation Acts in 1822 and other reductions of duties saw taxation fall by £8 million between 1823 and 1826, earning him the soubriquet ‘Prosperity Robinson’. The financial crisis of the mid-1820s weakened his credentials as Chancellor however and he resigned in December 1826. 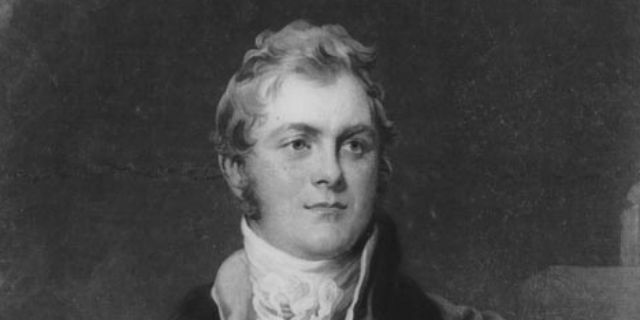 As a supporter of both the abolition of slavery and Catholic Emancipation , Robinson – elevated to Viscount Goderich in April 1827 – aligned himself with George Canning, serving as his Colonial Secretary and leader in the Lords. When Canning died, it was to Goderich that George IV turned to in August 1827 to lead the coalition of moderate Tories and Whigs that now constituted his government. Goderich harboured hopes of reshaping British politics through a ‘liberal’ administrative party (with proposals to replace indirect taxes with a property tax, and conciliatory policies for Ireland). However these foundered on his lack of a large personal following, the King’s interest in decisions about the shape of the government, and Goderich’s own sense of inadequacy due both to his own ill-health and that of his wife Sarah, daughter of the 4th Earl of Buckinghamshire. As early as December the monarch was exploring alternative options, and when news of this leaked to the press the ministry began to fragment. The final denouement came in an interview with the King on 8 January 1828 at which Goderich was humiliatingly asked to arrange his own replacement. The meeting, according to some reports, literally ended in tears, one source of Goderich’s less flattering nickname, ‘the Blubberer’ (lachrymosity was a recurring feature of his career). Goderich suffers from the unenviable distinction of being the only Prime Minister never to face parliament while in office. But his political career survived his dismissal. As a pragmatic, liberal figure, he served in ministries of changing hue as the liberal turn in 19th century British politics worked itself out. In April 1833, as the newly created Earl of Ripon, he joined Lord Grey’s ministry as Lord Privy Seal, having already served the Whig premier as Colonial Secretary from 1830. In 1834 he resigned over the government’s policies on the Irish Church and in 1836 joined the Conservative Party . In 1841 he was back as Sir Robert Peel’s president of the Board of Trade, and took his final government post as president of the India Board two years later In May 1846, in a fitting finale to his political career as a consistent and reasonably effective champion of economic liberalisation, it was Ripon who moved the abolition of the Corn Laws, a month before his resignation along with the rest of the government. As Prime Minister he never faced a session of Parliament – a unique distinction.